Cult of Mac’s own Charlie Sorrel explained the magic behind this slick feature built into iPhoto for iOS, but he didn’t spend much time on how to actually make it happen. I figured it might be high time to do just that, in today’s tip. Granted, there are many ways to get your photos from one device to another, including Dropbox, PhotoStream, Messages, and email, just to name a few. The joy of beaming via iPhoto, though, is most likely about collaboration. Imagine editing a photo on an iPad, then sending it to your partner’s iPhone for further tweaks. Sounds pretty fantastic, right? Here’s how it’s done. First of all, make sure that Location Services are enabled on both iOS devices. To do this, launch the Settings app on your iOS device, tap on the Location Services tab and toggle the On button. Make sure that iPhoto is toggled on in the list of apps that Location Services are enabled for, as well. Next, launch iPhoto on each device. Tap the little gear icon at the top right of the screen (on the iPad – the iPhone places this gear in the lower right) and toggle Wireless Beaming on. Choose a photo you want to use, and make your iPhoto edits. Enhance! Tap on the standard iOS Share button (it looks like a box with an arrow coming out to the right) and choose the Beam icon. You can grab the selected photo, or you can Choose another one from your library, tapping up to 100 thumbnails to mark the photos for beaming. A badge will pop up asking to Include Photo Location. You have to Allow this, or you won’t be able to Beam any photos, darn it. 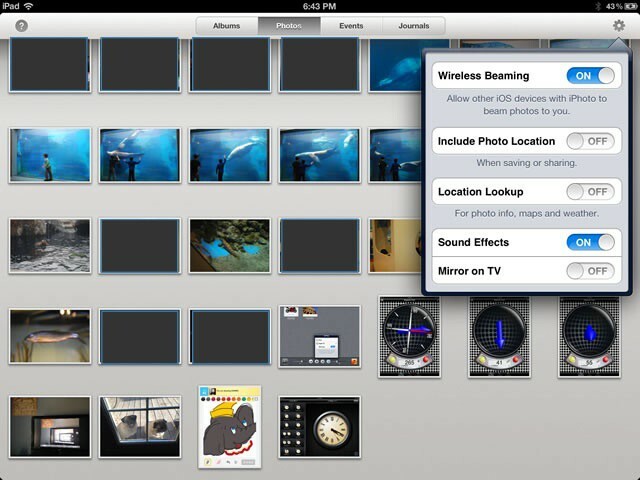 iPhoto for iOS will then find the other iOS device (as long as it’s on the same WiFi network) and list it for you. Tap on the name of the other device, then on the Beam Photos button. A badge will show up, telling you how many photos are headed across the network. Your second device will ask you to accept the photos with a tap on the Yes button. iPhoto will take care of the rest.